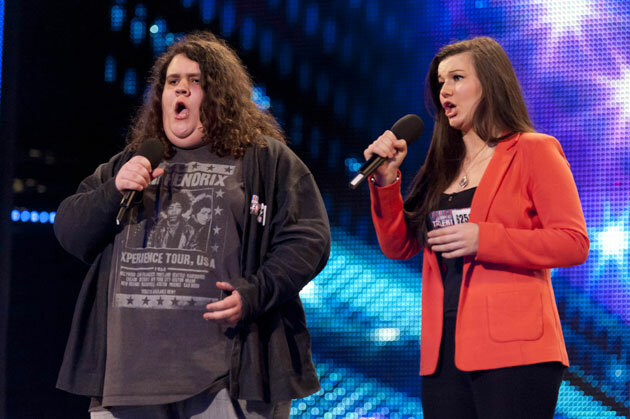 Britain’s Got Talent returns to our TV screens tonight with the first show of the auditions. Ant and Dec host the brand new sixth series of Britain’s most varied talent competition. Talent show supremo Simon Cowell returns to the programme after missing last year’s auditions process, and is joined on the panel by Amanda Holden and new judges Alesha Dixon and David Walliams. The contest kicks off with the first set of auditions, which feature performers who run the gamut from incredible to disastrous. The highlight of the night comes when Opera singer Jonathan Antoine, who has been dubbed ‘the new Susan Boyle’, takes to the stage at the London auditions. The 17-year-old and his singing partner Charlotte Jaconelli perform The Prayer by Celine Dion and Andrea Bocelli. When they walked on the stage the duo were jeered by the crowd, but by the end of their performance they received a standing ovation from the crowd. Simon then dropped a bombshell on the pair, saying: “Ok, this is what I think, Charlotte. I think you’re good, but Jonathan – you’re unbelievable. See their response and the rest of tonight’s acts from 8pm on ITV1 and ITV1 HD.